So you’re planning a wedding in Italy with BeA Alfresco Wedding – but did you know that we also have great ideas for your bachelorette party? Not the typical girls’ night out, involving a lot of alcohol and often a male exotic dancer that is sometimes arranged by the bridesmaids and friends of the bride – but something more appropriate to the romantic occasion of her marriage. 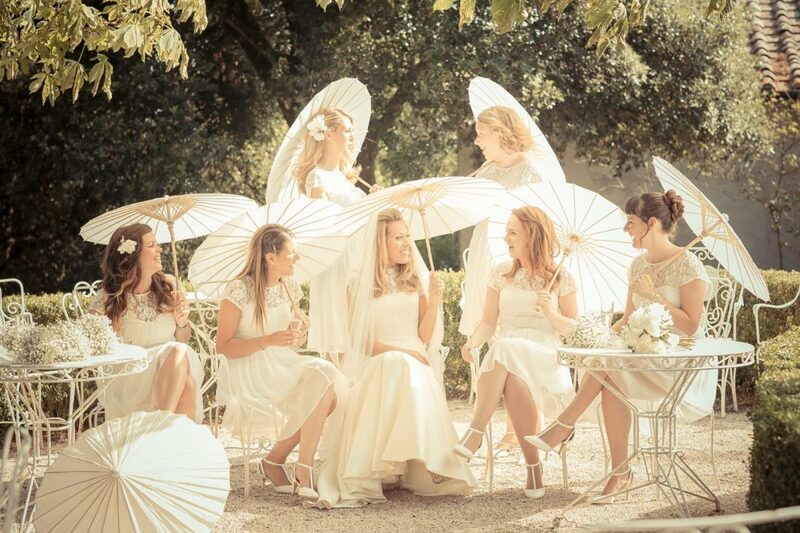 There are many, many ways to have fun in Tuscany; and we at BeA Alfresco Wedding can offer countless ideas to make your bachelorette party fun and trendy – and unlike any others you may have attended in the past. You and your guests could visit one of our local spas in the ancient village of Rapolano Terme in Siena and spend a day – or even a late night – enjoying a massage, or simply relaxing in the various thermal hot spring pools, followed by a relaxing dinner and the local wine. Some of the spas offer special treats, such as jazz music. Tuscan spas has dozens of treatment rooms and offers a multitude of spa experiences; including facials, manicures and pedicures, many different massages, body scrubs, and aromatherapy. What could possibly be a better way to enjoy a bachelorette party than to indulge in such luxury? If your party is to last for several days you might want to book a hot air balloon flight for a bird’s eye view of the beautiful Tuscan countryside. At BeA Alfresco we can make arrangements for you to fly over the Chianti region and, after landing, enjoy a champagne breakfast. If you prefer to keep your feet closer to the ground, you and your friends could enjoy a full day of five hours or a half day – two to three hours – of horseback riding near Siena. There you will find a horse to suit your experience and temperament – the people there are very careful to find the right horse ‘partner’ for each rider – and beginners can have a lesson in the ring to learn the basics of riding. You can also enjoy a catered picnic lunch. As you can imagine, this can be a lot of fun! However, you can enjoy all of the above and still have an exciting bachelorette party in Siena or Florence – or in any other city in Tuscany. The nightlife scene in the region is very lively; with bars, cafés, nightclubs and restaurants where you can eat and drink, sit outside, watch the world go by, and enjoy the many street performers. Whatever your choice is for your bachelorette party in Tuscany, you may be assured that we at BeA Alfresco are here to offer you a multitude of options to suit your taste and budget.